Þingvellir National Park, more commonly spelled Thingvellir, is geologically, historically and aesthetically special on any scale. This UNESCO World Heritage Site is located only 45 minutes from the capital and invites visitors on an epic exploration journey all year round. 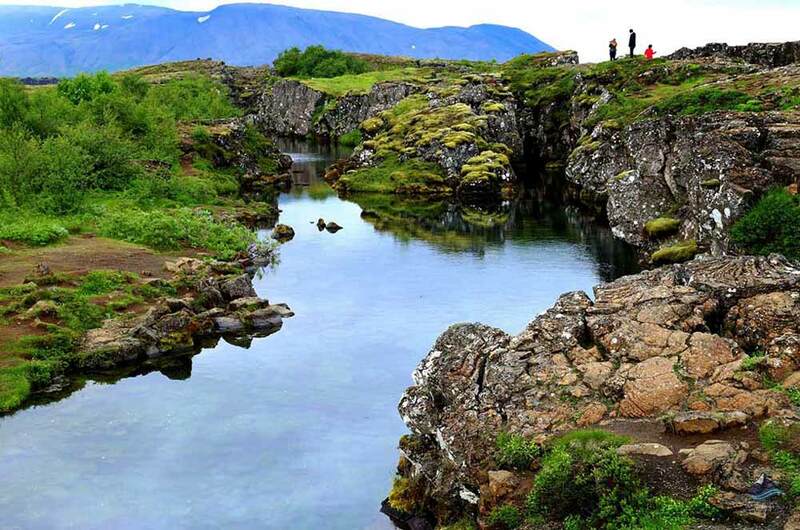 Where is Þingvellir located? 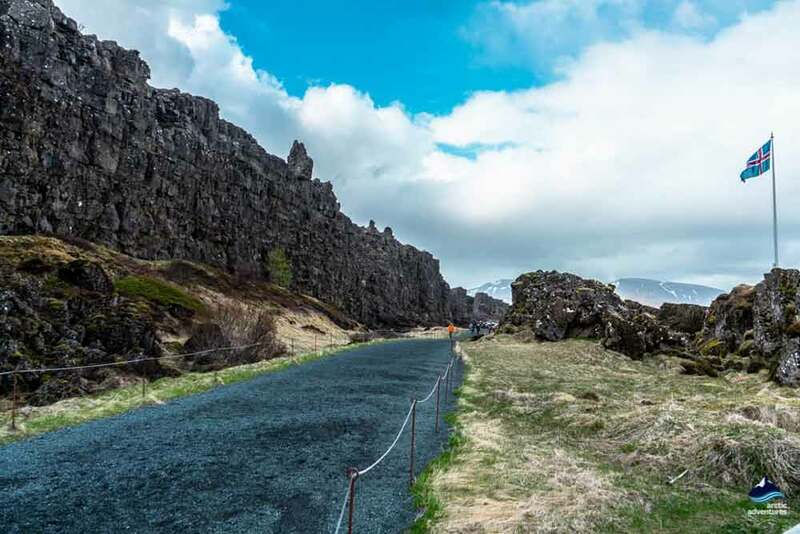 How to get to Þingvellir? 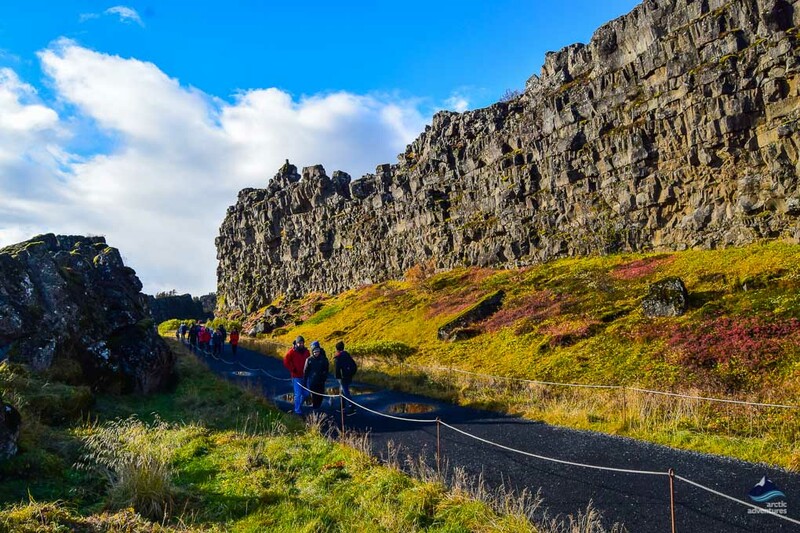 Why is Þingvellir the best place to see Continental plates move apart? 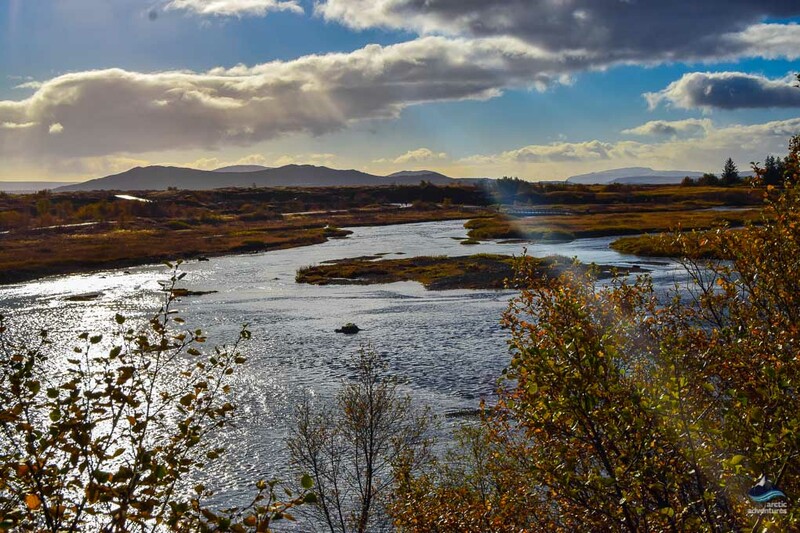 What you can’t miss at Þingvellir national park! What not to do at Þingvellir? Can I see the continental plates move apart with bare eyes? 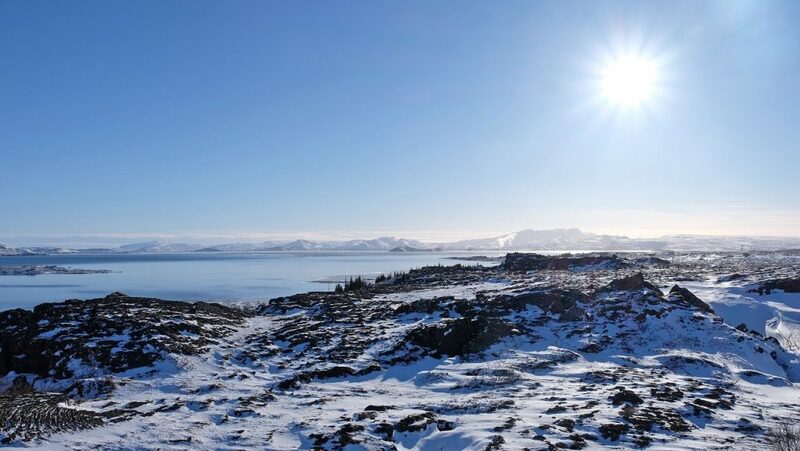 Why does the water in the Þingvellir lakes never freeze? 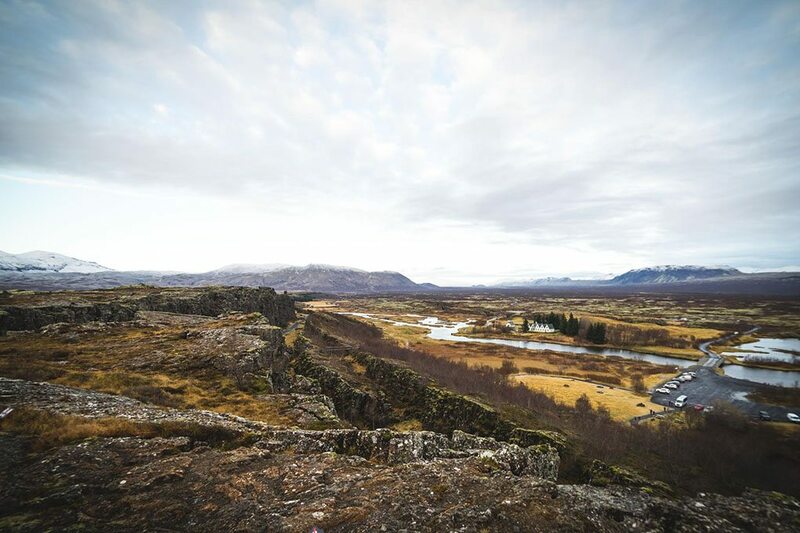 Þingvellir means assembly fields and in the year 930 AD, Iceland’s historic democratic parliament, one of the first in the world, was founded there. Most Icelandic people regard Þingvellir as a sacred place, a place of great beauty and an incredible stepping stone in their history. Around the year 1000 AD the great Law Speaker, Þorgeir Ljósvetningagoði Þorkelsson, declared Iceland’s peaceful conversion to Christianity right here at Þingvellir. A unique compromise was arrived at which made Christianity the official religion of Iceland. Pagans were still permitted to worship the Norse Gods in private and the disaster of what could have been a violent civil conflict was mostly avoided. 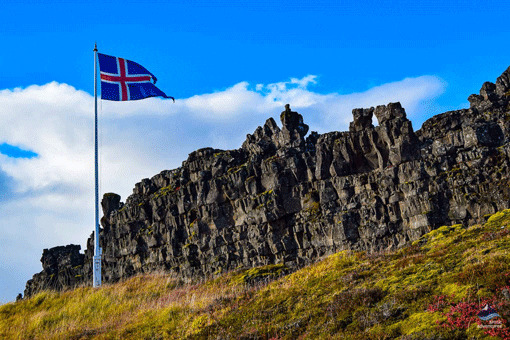 A flag marks Lögberg e. the Law Rock where the Law Speaker or Chief Goði stood to proclaim the law in the olden days. You will be able to stand in the spot where history was made – what a magical photo opportunity! 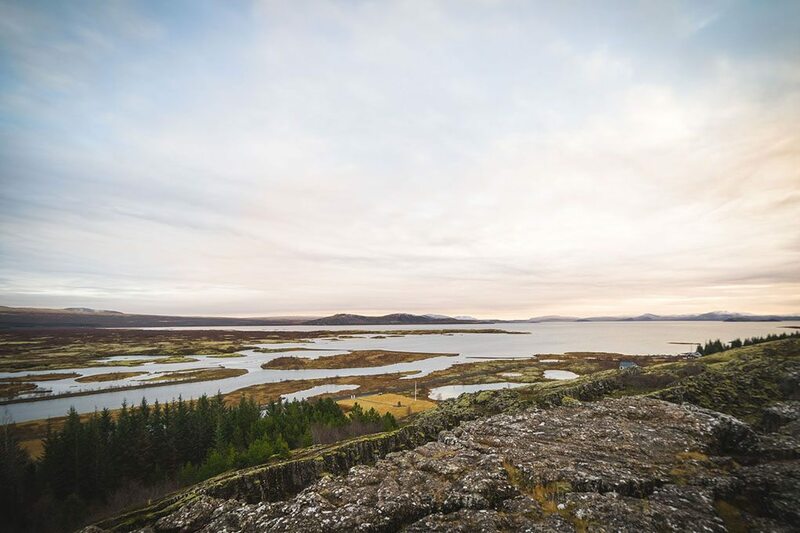 The geological processes which shaped the land at Þingvellir National Park are every bit as remarkable as the great historical events which took place there. 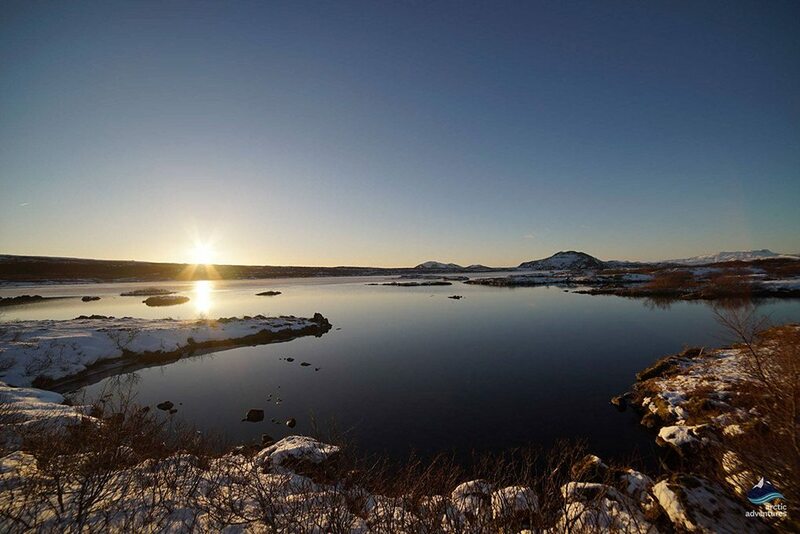 Since 2004 Þingvellir has been listed on UNESCO‘s World Heritage List for its geological the uniqueness and historical significance and the Icelandic nation is very proud of this incredible place. Þingvellir (Thingvellir) is in South Iceland, just 40 km (24,8 mi) from Reykjavík. You just need to follow Highway 1 (the Ring Road) through the little town of Mosfellsbær before turning to your right onto the road numbered 36. From Borgarnes, if you take the shortest route along Highway 1 and then the road numbered 52, the distance is around 89 km (55,3 mi). 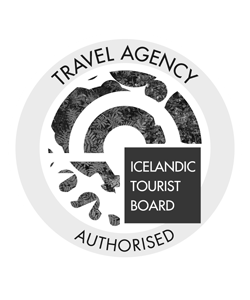 There are many interesting places nearby, a few of which are Gullfoss (70 km or 43,5 mi), Geysir (60.3 km or 37,4 mi), and Selfoss (40.3 km or 25 mi). 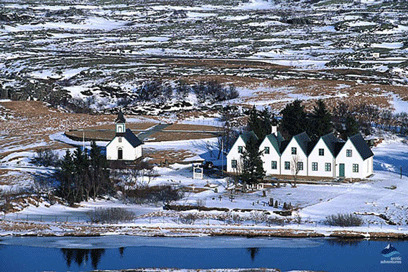 The name Þingvellir has long been problematic to those visiting Iceland. First, it’s the letter Þ, that many refer to as “the long P” but actually is pronounced “TH” and then it is the double “L” that requires you to make some kind of a click sound in the right side of your mouth to fully get it right. (This click sound error is the same error many made while trying to pronounce the famous glacier volcano Eyja-fjalla-jökull when it erupted in 2010). Icelanders will fully accept you writing it Þingvellir (the proper Icelandic way) or Thingvellir but once you are writing it Pingvellir you are pretty far off, at least in pronunciation. We are not even quite sure how that started. With pronouncing the word it’s best to split it up and try saying something more along the lines of “Thing-vedler”. This is the quickest way to say it 98% right! Why is Þingvellir the best place to see Continental plates move apart?? The Eurasian and North American tectonic plates meet at Þingvellir. They have for a long time been slowly drifting apart, creating the dramatic and rugged rift valley which runs through the sight. 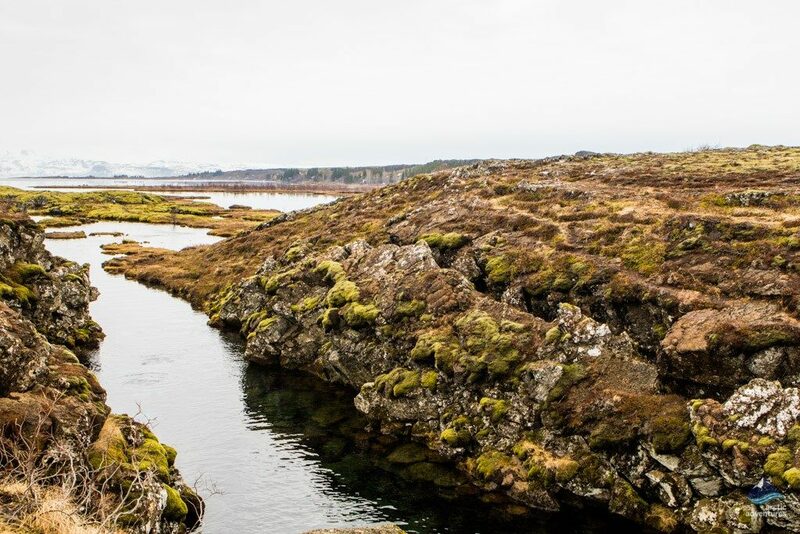 Þingvellir is one of the most extraordinary geological sites in Iceland, in fact otherworldly. At Þingvellir you can so clearly and exquisitely see how the two continental plates drift apart. Iceland is one of the few places in the world where you can see this happening on dry land and very likely the most stunning one! 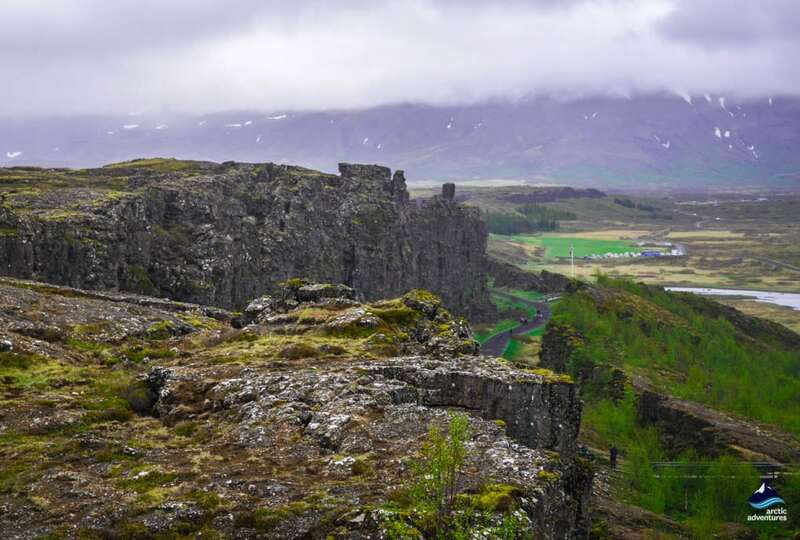 The plate boundaries can be seen so clearly at Þingvellir because by the end of the last Ice Age period, about 10-11 thousand years ago, great volcanic eruptions happened in the Þingvellir area. It creating mountains such as the famous Skjaldbreiður and the lava field you see in the park today. These eruptions kept lava flowing reaching miles and miles and making the vast area more rugged and spectacular, creating heights and depressions. But still, for some reason, the lava didn’t manage to fill up the existing crack. With time it started to open up even wider, decreasing the possibility of it ever filling up, and now with the additional drift of 2 cm every year it isn’t likely to ever do so. 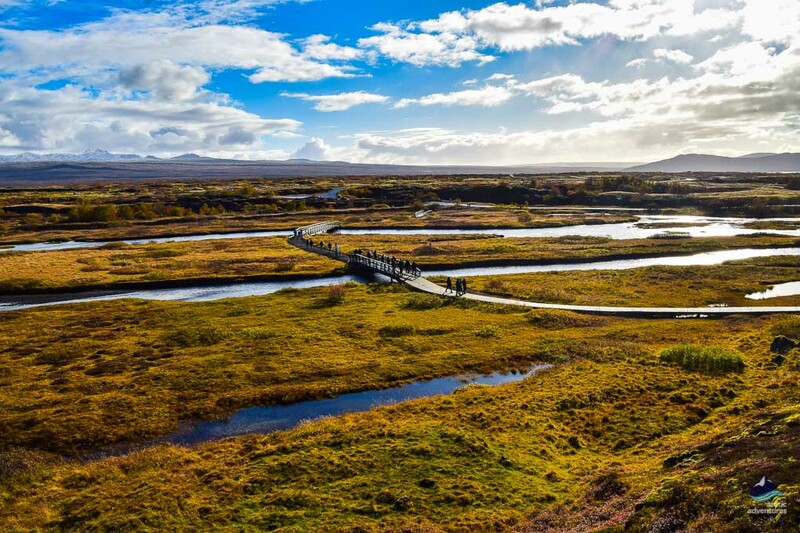 This makes the Þingvellir the best place to view this astonishing natural phenomenon as the landscape before you will display the drifting of the tectonic plates in the traditional dramatic way Icelandic nature loves to do! By standing at the Hakið viewing point you can get a view over the whole area, the gigantic valley and see very clearly how it drifts apart. The vista is absolutely stunning! 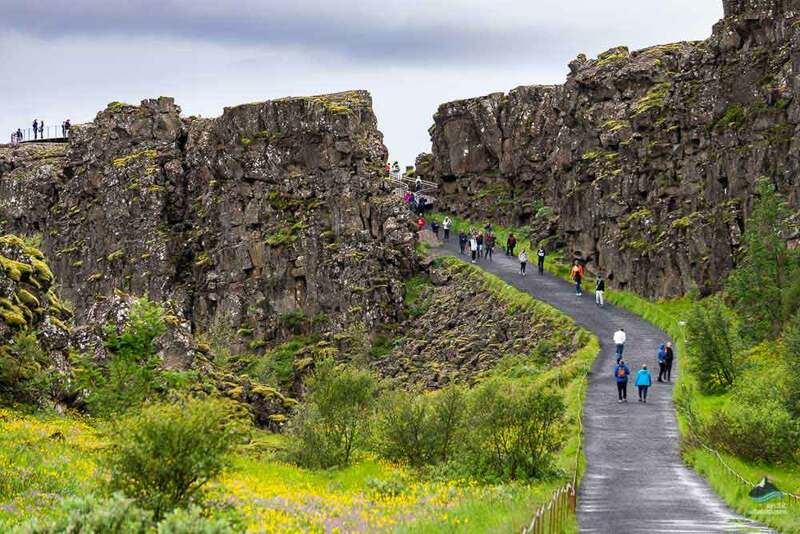 You can also walk down to Almannagjá to see some more interesting sights in the park and in the gully you will get a stronger feel for this unique place. Silfra is a fissure that sits right in the cut where the meeting of the continental places takes place. It formed quite recently in an earthquake and quickly filled up with water that had been filtering through the lava field for hundreds of years. 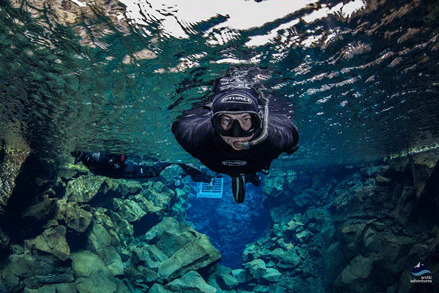 This means that the water, that originally comes from Langjökull glacier, is extremely clear and many say that the visibility for divers is the best in the world!We offer both snorkeling and diving tours in the fissure, providing you with great dry suits so you will stay warm in the glacial waters. 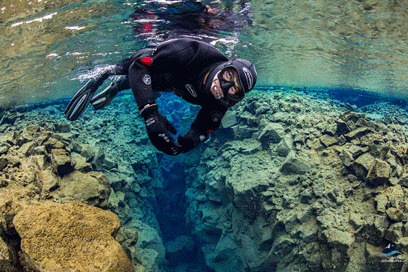 Silfra is often called the visibility wonderland and many take about feeling the ultimate zen-feeling. The experience of floating in between the continental plates feels like you are looking right into the earth core, it is completely incomparable and truly awe-inspiring! Öxarárfoss waterfall: The waterfall is extremely stunning and would be sad to miss. 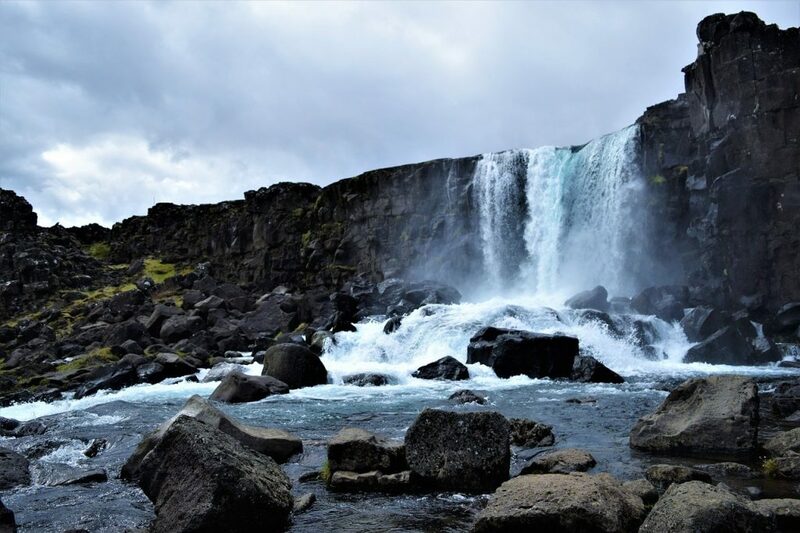 Öxarárfoss e. Axe River Waterfall is located in Almannagjá ravine so it’s hard to miss when roaming around the designated walking paths. 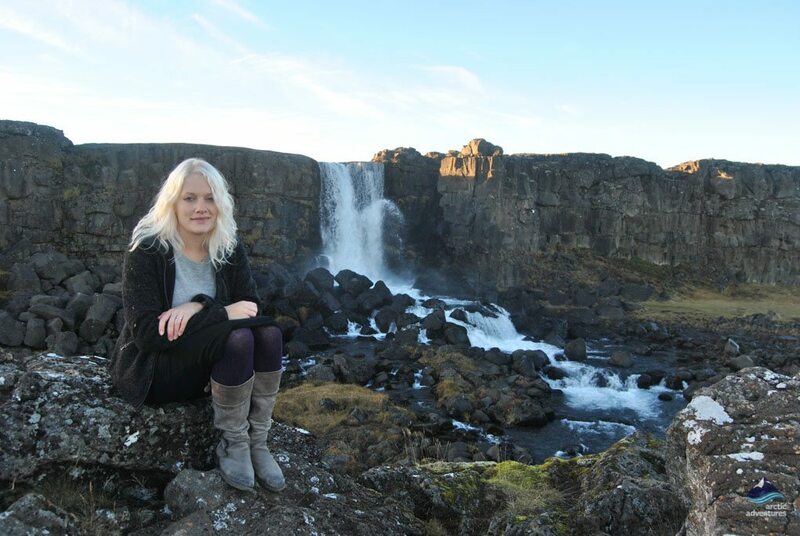 Fun Fact: The waterfall was moved by Vikings to make its location more suitable for the Alþingi parliament meetings. Drekkingarhylur pond: Where they used to drown women who had babies out of wedlock. A tragic but beautiful place and has a great sign to read all the history of it. Peningagjá pond: Where people have thrown coins for fortune for a very long time and they glisten beautifully in the water. A stunning sight in the crystal clear glacial water. Lögberg: e. The Law Rock – The exact location of the Lögberg is unknown, because of the changing geography of the rift valley over 1000 years but most believe it to be in Almannagjá. Lögberg was the place where the Lawspeaker would talk from and speeches and announcements were made from the location. Anyone attending Alþingi could make their argument from the Lögberg rock. Almannagjá: The ravine/gorge at Thingvellir where you can walk with high lava walls on both sides and see some stunning views in the meantime. A real Must-walk! 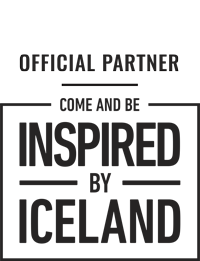 Visit without a guide, reading the signs or reading up before! This place is very historic and fascinating, but if you don’t know what you are looking at it might not live up to its real potential! Litter! It’s very important that you don’t litter whilst exploring this great historic site. The park is very well kept but with all the visitors coming every day we need all the help we can get to keep it in good shape. Wear flat shoes in winter! It’s very important to have sturdy boots while walking around in winter at Þingvellir, crampons might even be needed, you can buy them at any gas station for cheap. The continental or as they are also called, the tectonic plates, move very slowly apart, only about 2 centimeters a year, so you can not see any real movement with bare eyes. Nonetheless, the plates do move significantly over decades so if you visit with significant years apart you might be able to spot the difference! 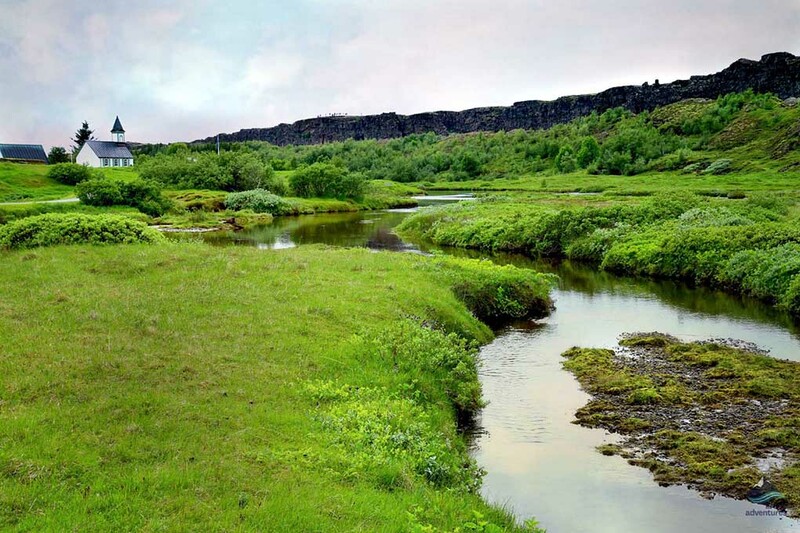 The water in the lakes, Silfra, Drekkingarhylur, Peningagjá, and the others never freezes due to the fact that it maintains the same temperature all year around and has a constant flow of water coming in at all time. The water’s temperature is about 3-5°c at the lower land and 2-3°c at higher land and stays at this stable temperature even on the coldest days! 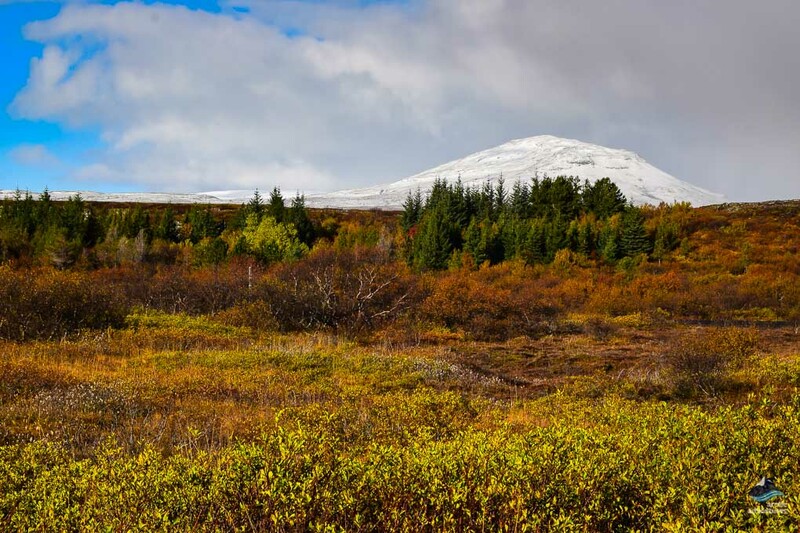 There are two separate camping sites in Thingvellir National park. 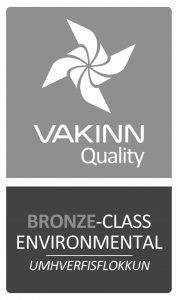 Facilities include showers, toilets, washing machines + dryers (800 ISK). Open: Vatnskot is open from the 1st of June to the 1st of September but Leirar all year round. Leirar is the bigger one, divided into 4 camping grounds. Vatnskot is the second one located at an abandoned farm by lake Thingvallavatn. Thingvellir appears in the shows as the narrow path leading to the Eyrie and again as the location of Arya and Sandor Clegane’s journey. For the third time, it appears when Brienne and the Hound engage in a bloody battle in the 4th season. 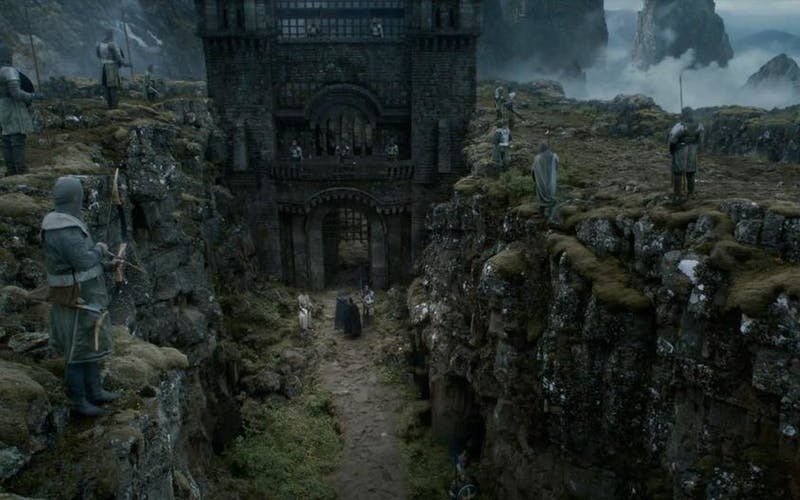 Other Games of Thrones filming locations in Iceland include Mt. Kirkjufell, Svínafellsjökull, Grjótagjá Hot Spring and Cave, Námaskarð, Stakkholtsgjá inside Þórsmörk, Dyrhólaey Cape and Lake Mývatn. Another fun fact, the Mountain is players by an Icelandic actor and the band that played at Joffrey’s wedding? It was actually the world-famous Icelandic band Sigur Rós. 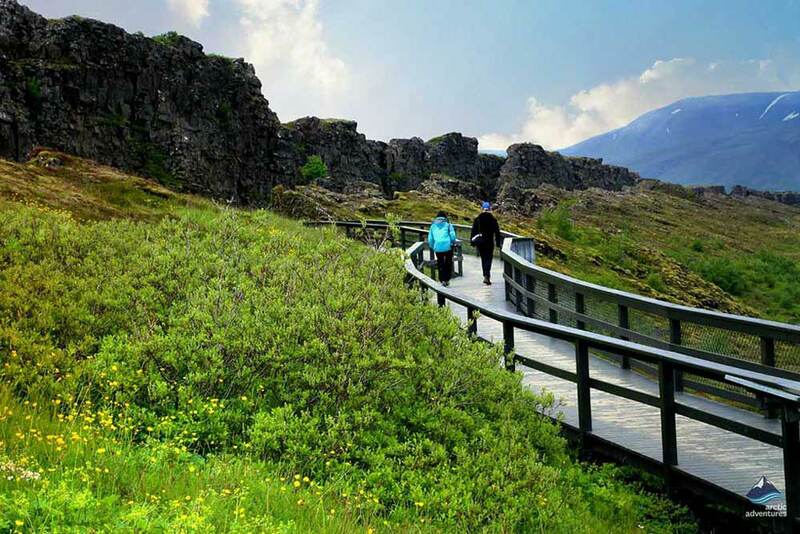 Thingvellir National Park is one of the highlights of the Golden Circle. 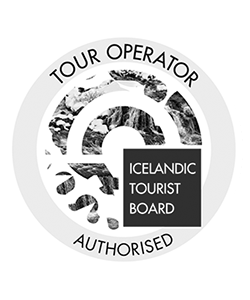 Here you find all of our tours around the Golden Circle.